A ‘Stylish Splash of David Bromstad’ you ask? Yes, you read that right! 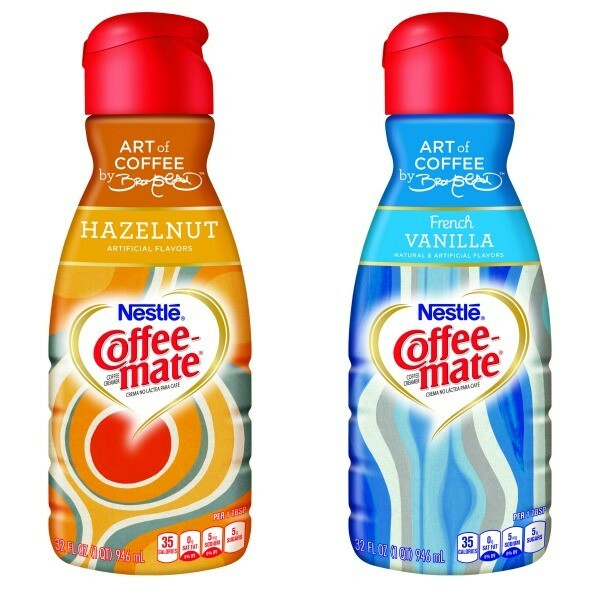 One of my all time favorite designers, David Bromstad, has teamed up with Coffee-mate and Target to bring us beautiful limited edition coffee creamer bottles. 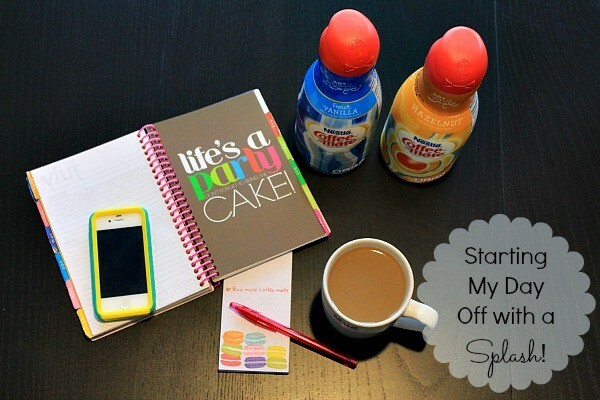 This is how I start off my mornings…coffee, splash of creamer, my planner, my phone and making a list + checking it twice. A few years ago I started to realize the importance of surrounding myself with the things I love; down to the little details. From the coffee cup I drink out of and the pens I write with, to home decor accessories that make me smile and that chair that says ‘come sit and relax’. My home is important to me. It’s my work space. It’s where I entertain friends. It’s where we live, sleep, eat, breathe, cry and belly laugh together as a family. Surrounding myself and bringing things into my home that make me feel good and inspire me to live a full life, just makes sense. I work in the early morning hours during the summer while my kids are blissfully sleeping. They’re older, which means they have embraced fully the joys of sleeping in. Those early morning hours are crucial to me. I need to be ready to tackle the day head on and get to work right away. What’s one way I do that? Surrounding myself with items that inspire my creativity. I carefully selected my day planner, my notepad and coffee cup to make sure my day starts off right. I absolutely love the idea of a bottle of creamer ‘designed with intention’. Like I said, it’s the little details in life that can inspire us to live big. Planning a Coffee Date or Party? Not only does grabbing the David Bromstad Coffee-mate creamer in the mornings put a smile on my face, but these bottles would look stunning displayed on a table. Whether you’re having a few girlfriends over for coffee and a play-date or hosting your next office party, these bottles can go as-is on the table. I love that! How Does Coffee-mate Inspire You? Prizes and Fun! Coffee-mate wants to know how they inspire you and help you make a splash in your day. Show them with a photo to win fabulous prizes using #CMInspiresSweepsEntry on Instagram and Twitter. Coffee-mate is giving away prizes for entering the #CMInspires sweepstakes such as $500 Target GiftCards, a year’s worth of Coffee-mate and a signed print from David Bromstad! How fun! Don’t miss the Coffee-mate #CMInspires Twitter Party on Thursday, August 14 at 7pm Central, co-hosted by Courtney Whitmore of Pizzazzerie and David Bromstad. The David Bromstad limited edition Coffee-mate bottles (French Vanilla and Hazelnut flavors) are available exclusively at Target stores nationwide. Pick them up today and get inspired! And enter the sweepstakes of course! Not only can you enter the Coffee-mate sweepstakes by submitting a photo, but you can enter a giveaway here on Mom Fabulous! I have one Coffee-mate prize pack to give away. The prize pack includes 5 mini journals, a pack of colorful pens, a coffee poster and 2 full-value product coupons ($45 ARV). For more inspired fun, snap a photo of the newly designed bottles and share it on Instagram or Twitter with the hashtag #CMInspiresSweepsEntry for a chance to win a year’s worth of Coffee-mate, $500 Target GiftCards, and a signed print from David Bromstad! I’m new to checking out your site. Taking care of two puppies and dog is a lot of work! I admit it … I drink an entire pot of coffee every day! SO I think that qualifies me as a coffee lover — LOL! Thanks for sharing this with us, I love coffee! I am a huge coffee drinker – and a big fan of CoffeeMate, especially their flavored options like Amaretto and Thin Mints creamers! I am a big fan of Iced coffee! I love the smell of coffee, but not the taste. My husband however can’t live without coffee. Everyone in my house are huge coffee drinkers. i’m lactose intolerant,so i love powdered stuff! My hubs drinks coffee. I like the poster cause that is something that he would say about ruling the world! 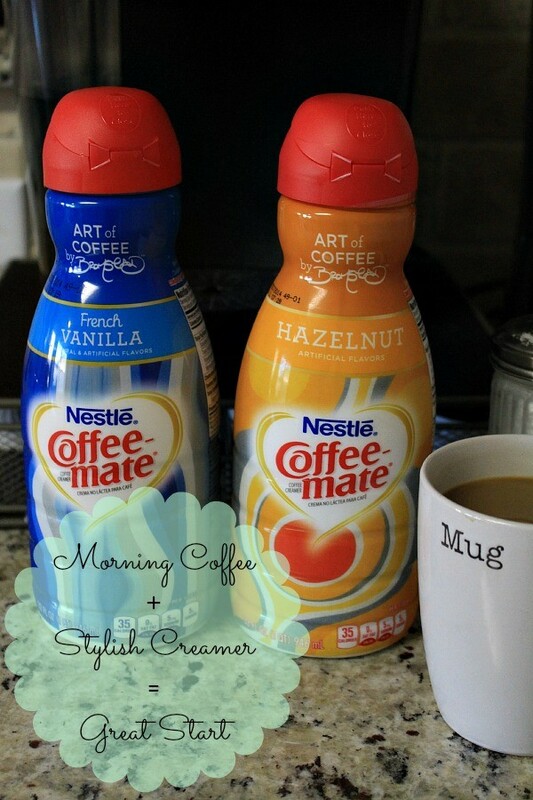 Coffee-mate is my go to creamer… I love the different varieties! I love the smell of coffee in the morning, it’s the perfect start to my day! I love you! I love coffee! What else can I say? 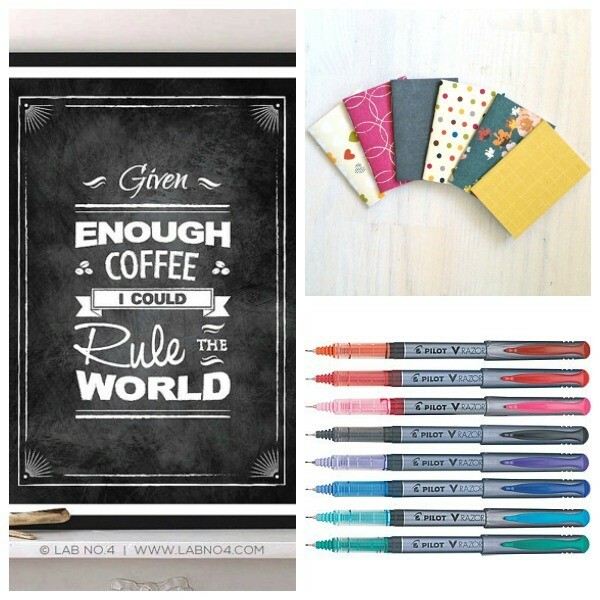 I love the pens, I love the notebooks, I love this giveaway! I drink coffee at least 4 times a day. I love it and my favorite coffee mate flavor is French vanilla. I just want to say… I love the blog and the giveaways! I love coffee so much I’m on my fourth cup today! I love coffee morning noon and night! I love coffee and pens. Always like to have new pens. I drink coffee through out the day. I love putting of creamer in my coffee. I love coffee with coffee-mate vanilla creamer. Thank you for an awesome giveaway! Coffee is great! I did not drink coffee until after I got married and was making coffee for my husband. I enjoyed the smell and finally decided to try it. Now 3 of my 4 kids (ages 17-24) love coffee too. I LOVE LOVE LOVE LOVE LOVE COFFEEEEEEEE!!!! Iced coffee with hazelnut coffee mate…YUMMM! Love my morning coffee with creamer! I love coffee and colorful pens! Thanks for the giveaway. I am going to Disneyland in January!! I can only drink coffee with lots of flavored creamer in it~! I LOVE WINE!!!! I happen to really enjoy a nice glass of Merlot, but I do love the drinkablility of Moscato!!!! I am a huge coffee fan! I can’t start my day without it!!! Hi my name is Kathy Mills and I’m a coffeeholic!!!!! God grant me coffee to change the things I can change, and wine to accept the things I can’t. I never got into the coffee habit, but I have a big pot ready every morning for my wife, with her CoffeeMate flavor of the month. We are a family of coffee drinkers. We all have the favorite cup that no-one is allowed to drink from. Does anyone else have that? I love coffee I drink it at least 5 times a day… Iced or hot! Would have to say that we heart coffee! I love coffee and Coffee-Mate creamers! I love those Pilot brand pens! I love to drink coffee. I love coffee so much!! I love adding CoffeeMate to my hot cocoa. I definitely need my morning coffee! I drink a cup of coffee everyday. Love it! I love Coffee Mate French Vanilla in my coffee. I love coffee with Coffee Mate Hazelnut creamer ! I am a big coffee fan. When I was on a month long backpacking trip, any time we crossed a town, I got me one of those fattening coffees and didn’t have to worry about the extra calories. I love coffee! My obsession started with vanilla iced coffee from Dunkin Donuts. Now I drink regular (unflavored) hot and iced coffee. Perfect start to the morning! I love coffee and I love coffeemate creamer! I would coffee with cream and sugar. I can’t wait for the Peppermint Mocha coffeemate to come back. I’m drinking my first cup of coffee right now! French Vanilla! Yumm! Gotta love my coffee and flavored creamer! Perfect start of the day! Coffee is the only thing that saves my husband’s life some days. After reading this blog post, I’ve got to go get another cup of coffee. Thanks for the opportunity to win! I have a coffee every morning and I have to say I do love coffee! I can’t start my day without one. Coffee keeps my life moving. I love coffee mate french vanilla!!! I love drinking coffee while reading your blog. I heart the smell of coffee! I am a coffee addict! Hey, it’s better than a lot of other things. I love coffee with real cream. I love coffee and admit I drink it all through the day. I like flavored creamers as they give my coffee a smooth and flavorful taste to it. Loving coffee is an understatement. It is my lifeline!! Such a nice prize. Thanks for the opportunity! I love coffee and it keeps me going throughout the day. Coffee-Mate makes coffee even better. I love and must have coffee first thing in the morning! I like coffee with cream when i drink it. Coffee runs through my veins I NEED it lol. I love both coffee and tea. I love tea and ilike this giveaway. I like trying different blends of coffee and different creamers in them! Coffee is YUMMY, my favorite way to drink it is cold. Love me a nice iced coffee. I love me some coffee! I love to journal! Love your blog! Coffee is the best way to start the day, especially if it has French Vanilla Coffee Mate in it. coffee is my favorite thing to drink. i have already had 3 cups today and i plan on another once i get home. I love iced coffee in the summer and hot coffee in the winter. I enjoy drinking iced coffee with coffeemate creamers. I love coffee! And you. Just to let you know that somebody loves you today and that is me! I really enjoy my morning cup of coffee or two. In fact, I’m enjoying a cup right now while working on the computer. I love drinking coffee, especially with French vanilla creamer. I love coffee, especially with flavored creamers. I rarely drink anything else. I am a coffee-lover and I thank you for hosting this giveaway! I love coffee so much! Every day, I get up and make my iced coffee with concentrated coffee and CoffeeMate. I transport myself to heaven like that… Hmmmmm. Thanks for the giveaway…couldn’t function without copious amounts of coffee !